Meet the Illustrious Melissa Fahn! Joining us for #AnimeUSA2015 is the very talented Melissa Fahn! Fahn is best known for her role as Cowboy Bebop’s eccentric child hacker, Edward, though is also notable for her roles as FLCL’s Ninamori, Digmon Tamers’ Rika, Fire Emblem Awakening’s Maribelle, and as Gaz on Nickelodeon’s Invader Zim. When not lending her voice to animation and gaming, Fahn is an accomplished singer and stage actor, having appeared in musicals on and off Broadway, including Wicked, Grease and West Side Story. Her debut R&B album, Avignon, was released in 2007. Come meet her this Halloween weekend, October 30th – November 1st! Looking for somewhere to stay for AUSA 2015? Look no further! The convention hotel’s room block is now open. Go and reserve your room now. We’re pleased to announce our new Convention Chair for the year of 2015, Kat Sarfati. Sarfati has been working for Anime USA since 2009. She has over 8 years of professional experience with educational non-profits. Her own journey to fandom began as a child growing up with science fiction and anime; she was introduced to anime when she saw Sailor Moon on television after school. Sarfati got involved with fan-hosted conventions in 2005, starting with Balticon and then soon after, Anime USA and Katsucon. She has held positions in convention security, programming, staff registration, and more. 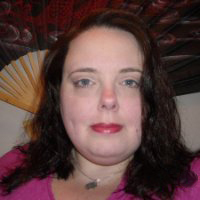 In 2014, she served as the Director of Personnel for Anime USA. Sarfati looks forward to serving our members as well as our staff to the best of her ability. If you have any comments or suggestions, please feel free to reach out to her at chair@animeusa.org. In 2015, we will be expanding on our children’s programming to include fun Halloween-themed events and more Please join us Halloween weekend, October 30–November 1, 2015.